The Pas was named the seat of the Northern Judicial District in l9l6, four years after Manitoba's northern boundary was extended from 52° 50' to the 60th parallel. George Nelson Taylor, the first architect in The Pas, designed this building for the new district. 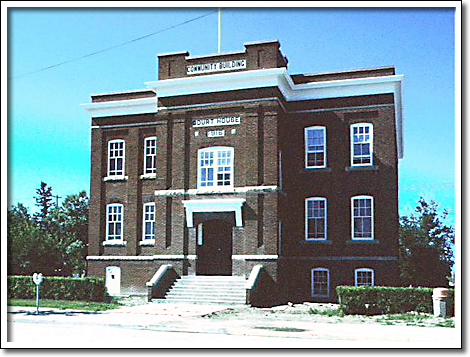 It was unique among Manitoba court houses as it had second floor space to be used exclusively as a public assembly hall separate from the main floor courtroom. Completed in l9l7, it became the centre of the town's social activities. The Pas Community Building was a physical declaration of Manitoba's faith in the North and of the importance of The Pas as a regional centre. The building closed after new court facilities opened in l982. With strong local support, the Town of The Pas acquired the edifice from the provincial government. It now serves the community as The Sam Waller Museum.